Another port of call during the weekend was Worcester. I wanted to visit the Cathedral in connection with my family history researches. It’s a lovely cathedral and you can see its tower from a distance so not hard to find in the centre of the city. 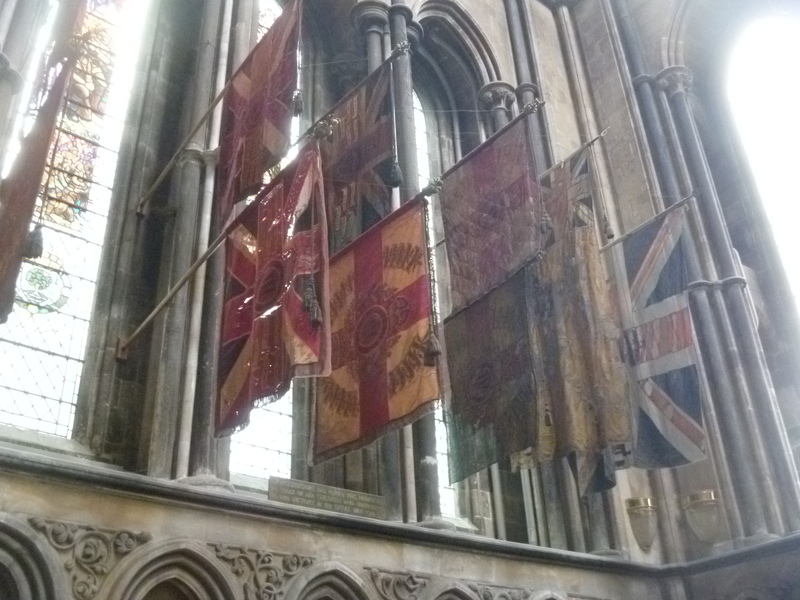 I had contacted the Vergers in advance in order arrange to see the Roll of Honour in which my relative is listed and introduced myself to a volunteer welcomer on arrival. A Verger was summoned and soon I was able to inspect the book and find his name. 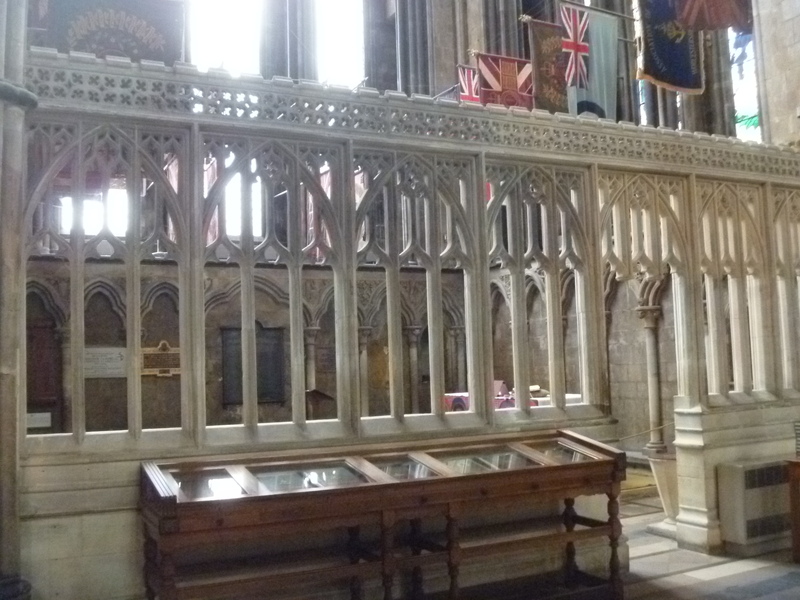 I then took some time to look around the St George’s Chapel where the Roll of Honour rests. 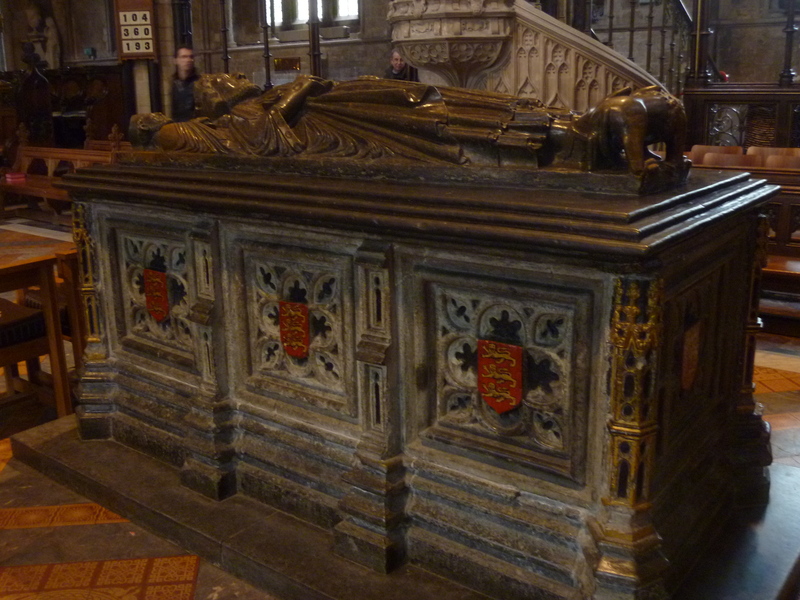 The most significant tomb in Worcester Cathedral is that of King John. 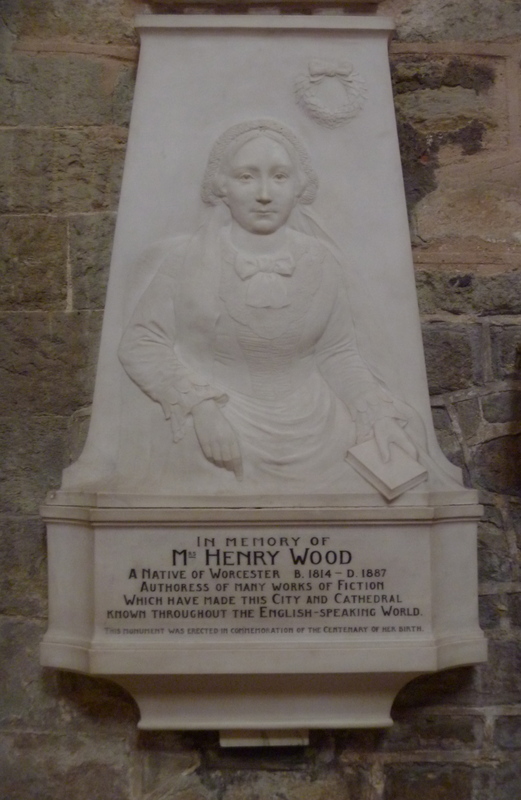 In addition, in the “Poets Corner”, I found the memorial to Victorian author Mrs Henry Wood. A prolific writer, she is perhaps best known for her book “East Lynne”. For most people the name of the village of Strensham is synonymous with the Motorway Service Station of the same name on the M5. But for me it is the village where my relatives lived during the early years of the last century. More about them later. Strensham is divided in more ways than one; there’s a Lower Strensham and an Upper Strensham and the M5 motorway cuts between the two. 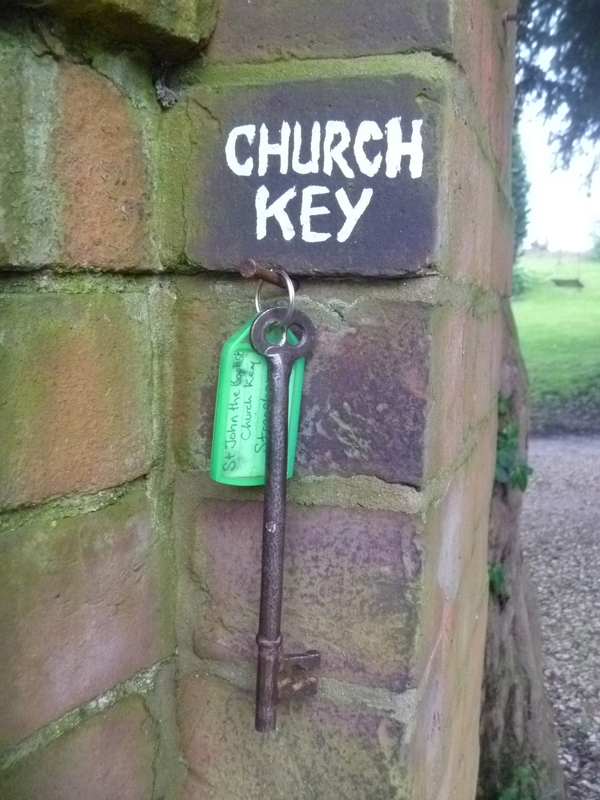 However, far from the noise of the Services and the Motorway, Strensham church lies down a long lane across fields and even far from the Strenshams. 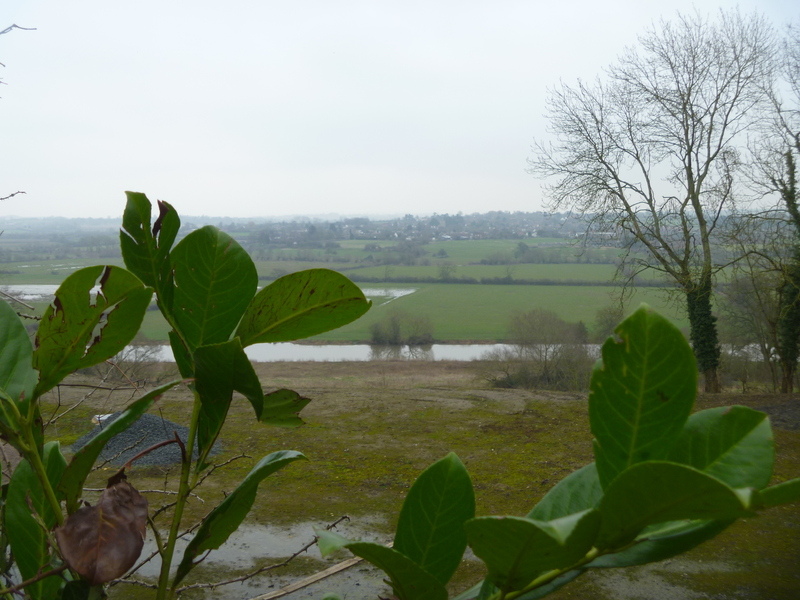 It stands on cliff overlooking the River Avon. Now that I have visited I notice that you can see its creamy white tower as you drive up and down the motorway. 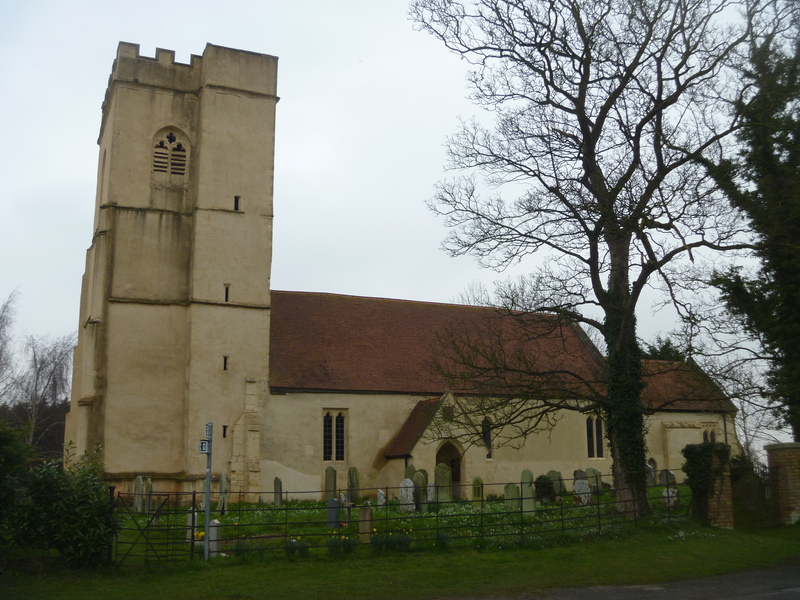 The Church of St John The Baptist, Strensham is listed in Simon Jenkins’ England’s Thousand Best Churches and given one star. 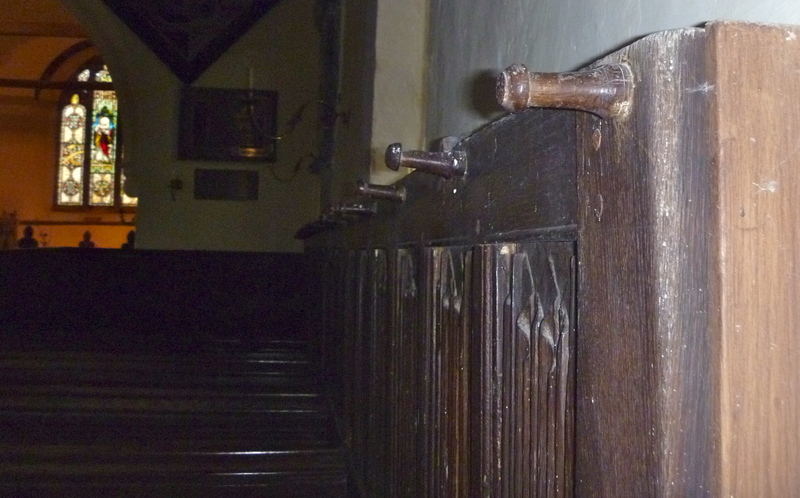 It is also cared for by The Churches Conservation Trust. 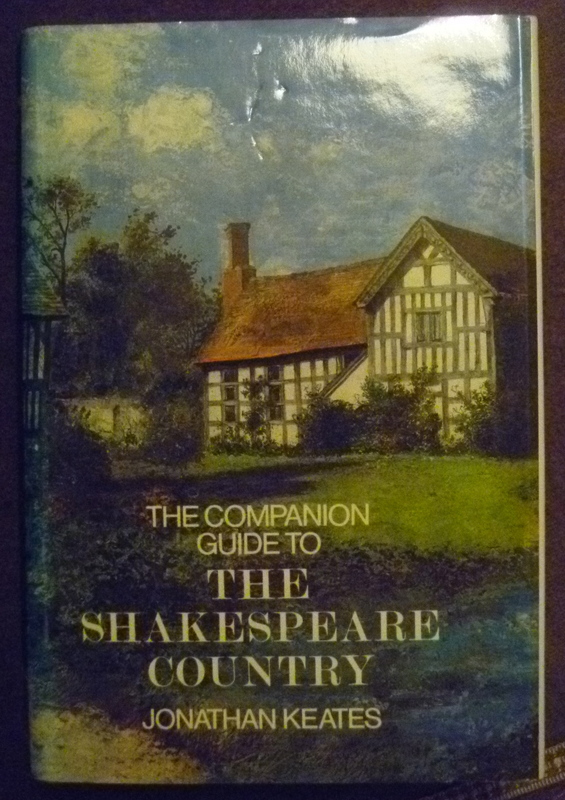 And there is a whole page about it in Jonathan Keates’ The Companion Guide to The Shakespeare Country. One remark in this book that I rather like is his “More Norfolk than Worcestershire (it recalls Ranworth), this set of twenty-three paintings is extraordinary … “. Well, my family came from Norfolk to live in Worcestershire for possibly a couple of decades in the early twentieth century, returning to Norfolk before 1920. 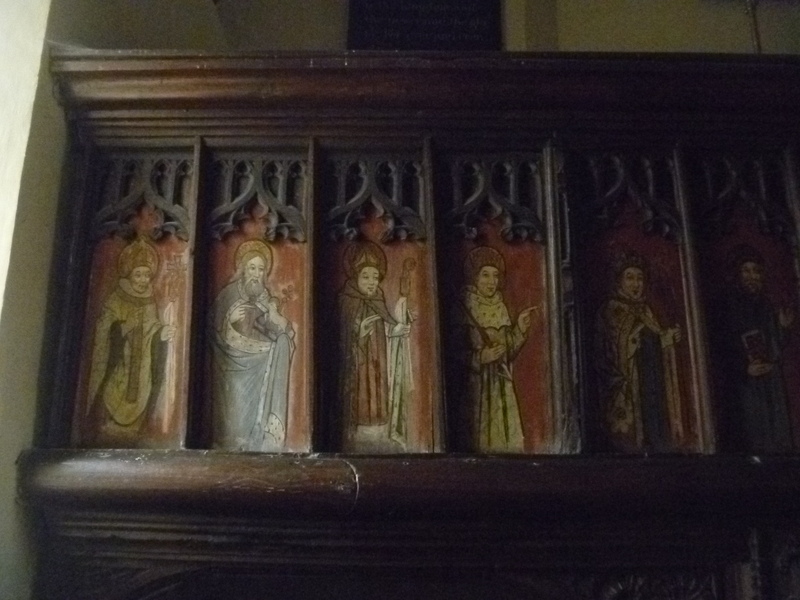 In addition to these painted panels the church boasts some impressive monuments, superb linenfold panelling and early 16th century pews. 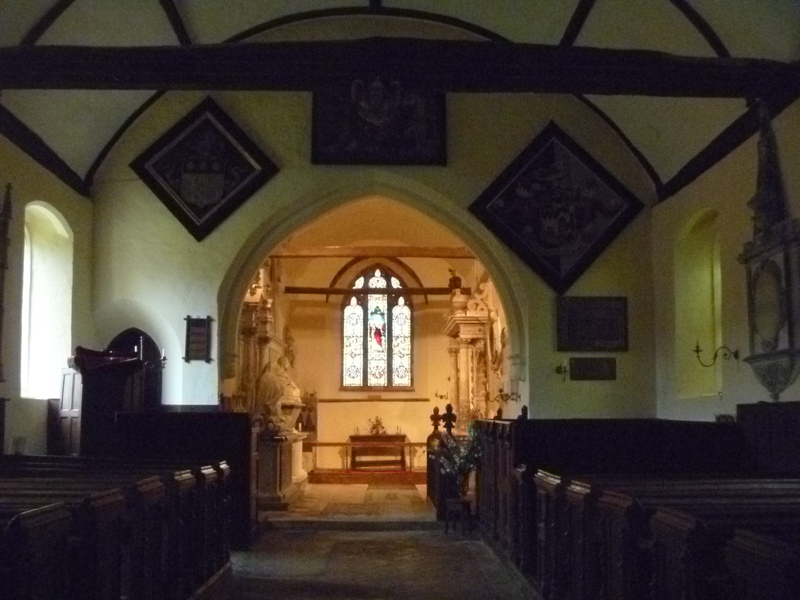 The chancel lights up as you enter but elsewhere it looks as if the gas mantels are still in use during the occasional services that are still held here. 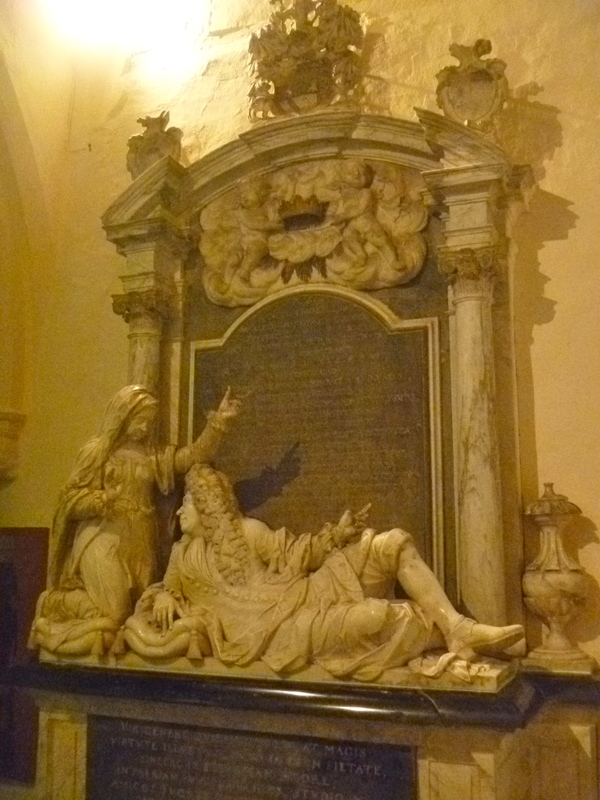 This entry was posted in Church Crawling with Milady, Milady travels at home and tagged Cathedrals, Churches, Worcestershire. The church would make a lovelier place for resting & refreshing than the usual services, so I think we’ll make a point of stopping here next time. Excellent idea, Nilly. We only don’t know Strensham Services because we travel to Devon via M1, M69, A46 (stopping always at The Fleece in Bretforton) joining the M5 at jct 9 just south of the service station.